Last weekend, we had a Christmas party to attend. Naturally, I was psyched to sport my holiday rose nails, but the morning of the party, I got a big ole chip on my thumb. Because, obviously. Once I recovered from my rage, I realized that I had to whip up something quick and easy because I simply don't do chipped and/or naked nails. Like, ever. Enter, the negative space mani. You know, because you don't have to put polish on your whole nail, which means the dry time is pretty fast. Yay for convenient trends! Haha! I started with my standard coat of OPI Nail Envy (Matte) and once it was dry, I cut the make-up sponge in half, lengthwise. Then, I painted on a narrow stripe of Paper Mache onto the tip of the sponge and dabbed it onto the top third of each nail. After two coats, which dried super quickly (yay! ), I used the same technique with The Outer Edge. On the final coat, I went a little lower, to make the tips uneven so they'd look like falling snow. The final step was all about the balls. I've had these guys for a while but haven't used them because they stick up way more than circular studs. But, they remind me of my Grandma's Rice Krispie squares, which she only makes around the holidays and tops with edible silver balls, so they were totally appropriate for this holiday mani. Of course, the downside is looking at them made me hungry but it was worth the sacrifice. Haha! Placing them was the hardest part, because they're kind of big and need somewhere flat to lie. Having curved nail beds presented QUITE the challenge but I managed to get them as flat as possible, while also as centred as possible, before the quick dry top coat dried (which made me feel all boss-like and such, haha!). As expected, the wear on the balls was pretty awful, which is probably because they stick up so far. I added two coats of top coat but by the next morning, most of the balls had dulled at their peaks. It was still a fun look, though, and considering the small time investment, I'm happy with the result. 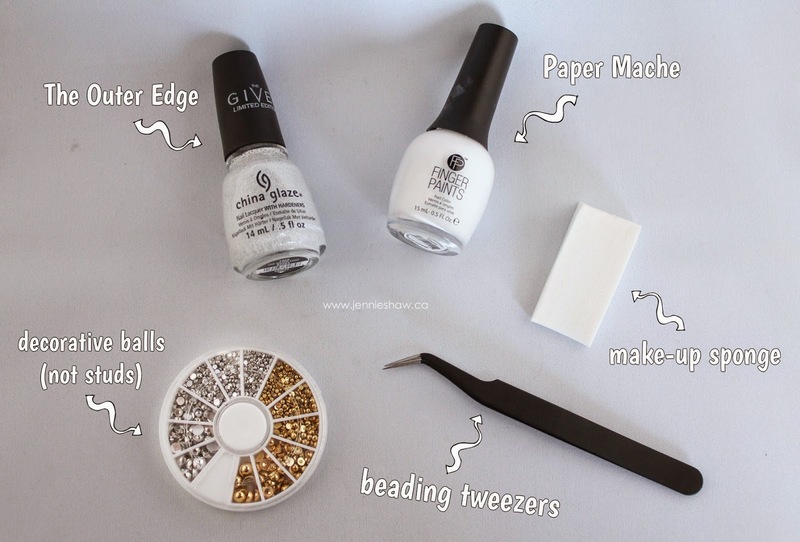 If you're digging this mani but don't have any balls lying around (haha) then you could just substitute a dot of a silver polish for the same look. That would also mean you'd likely get a few days out of the mani too, which is always a good thing because I get that not everyone wants to paint their nails on a bi-daily basis. Haha! What were you rocking this week? Link up and show 'em off! I think that's a lot of the reason I haven't ever experimented with studs. I always worry that they just wouldn't wear right and fall right off. I remember as a kid I was obsessed with the idea of having "crystals" on my nails and they would fall right off. Love the mani though friend! chip nails are the worst. love that this is simple but festive. It's very festive without being kitschy. Well done! Snow, what's that? :-) I doubt I'll see any this year unless it's on my nails. I went with icicles this week. I love that the gradient sort of goes in different directions and makes it look more realistic. Very pretty! I always wondered about nail jewels. I think they would really annoy me. It looks cute though. Jennie I am SO the same way with naked or chipped nails. And there is this other blogger that always shows her nails and they look horrid. I cringe when I see the pics...paint on her fingers and their all different lenghts. For shame! LOL But I promise you that we are sisters from another mister, mother, basically not related at all but OMG we are so much alike! haha Love those gifs too!